The newly renovated UCSB Library will begin accommodating more students during Late Night Study hours beginning Jan. 31. This includes keeping the first floor of Mountain Side open in addition to the two-story Learning Commons at the far end of Mountain Side. 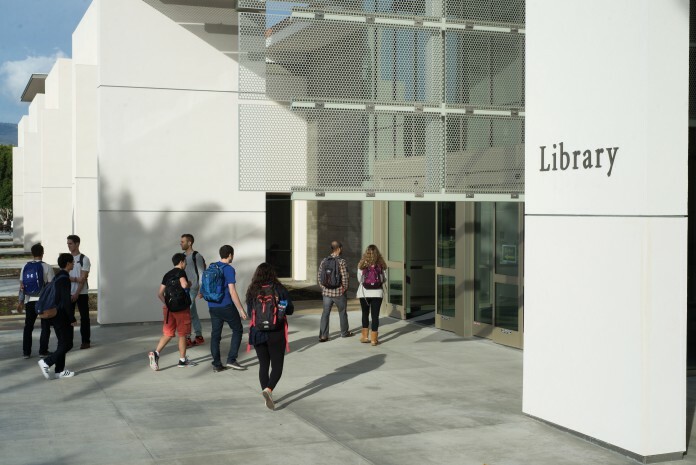 This January marked the grand opening for the greatly anticipated renovated UCSB Library. To many students, the library extension meant a less-crowded place to study and more seats during the busy midterm and finals season. However, as soon as week four and five rolled around, students were confused to learn that the Library’s Late Night Study hours had been confined to a smaller section of the library: solely the Learning Commons on floors one and two of Mountain Side, as opposed to the much larger space previously offered, the first and second floors of Ocean Side. This decision led to questions regarding the purpose of the library extension and the reasoning behind attempting to accommodate the thousands of UCSB students into a smaller space. The design for the UCSB Library Addition and Renovation evolved gradually over the roughly fifteen years since it was first proposed, according to Rebecca Metzger, Assistant University Librarian for Outreach & Academic Collaboration. Initially, the extension was meant to address the need to house collection materials, however, as time exposed different concerns, the planning was altered to devote the space to “library users and the new ways in which they study, research and learn,” Metzger said. This was addressed by providing group and individual study spaces, widely dispersed outlets, a café environment as well as Late Night Study. Before the construction began in August of 2013, only one room off the main entrance of the library was offered for overnight study and did not include any computers or printers. After having to completely close off the room to allow for seismic retrofitting, the library re-evaluated the reasons for offering Late Night Study and decided that creating a secure environment was of utmost concern. Thus, CSOs were hired to monitor the space in addition to the installation of card readers at the library entrance. It was during this time that the library expanded to include the first two floors of the Ocean Side library for Late Night Study, although it had always been intended to be temporary during construction. When designating which space is to be made available for Late Night Study, Metzger explained, several considerations must be taken into account. Firstly, a controlled environment that is safe and exclusive to UCSB students must provided, thus, entrances and exits must be limited during the time the service is being offered. Secondly, the security of collection materials and technology investments must be protected. Due to the absence of library staff during Late Night Study, CSOs must be hired to oversee the building in addition to having the fire marshal approve the footprint to ensure that appropriate emergency exits are implemented. Lastly, the decision is made based on gathered data of prior usage of the space. Based on the prior usage data collected over the years, offering the Learning Commons during regular weeks seemed to accommodate the students utilizing the Late Night Study service. Metzger explained that the library had always intended to expand the space during Dead and Finals weeks, but after opening on Jan. 4, the usage of Late Night Study increased tremendously. After receiving feedback from students through email and social media, in addition to tracking the number of students utilizing the service, it became clear that the new library is attracting more students than ever before. Louis Mariano, off-campus senator and third year political science major, was one of the many students who decided to voice their concerns. After attempting to search for a seat in order to write his paper, Mariano became frustrated with the lack of available space provided. With finals in the near future, Mariano anticipated vast amounts of unhappy students in an overcrowded environment, thus, decided to send the library administration an email with his complaints and suggestions. A couple of days later, Mariano received an email stating that more furniture was being installed in the Learning Commons in addition to plans on implementing a change to the Late Night Study footprint in the next few weeks as well as encouraging “students to take advantage of the already generous hours of the Library and to plan accordingly.” To this, Mariano responded by detailing his various concerns. This included the concern that more furniture wouldn’t solve the issue of overall space in the Learning Commons and the reality of students not being able to use the library during regular hours because of class, work and other extracurricular obligations. The same day, Mariano received a follow-up email stating the library’s decision to expand Late Night Study as of Sun., Jan. 31 to include the first floor Mountain Side, in addition to over 250 seats, which will more than double the available seating during Late Night Hours. Throughout the entire process, Mariano felt that the library acted efficiently and empathically in rapidly resolving the concerns of the student body. As this widely demanded service continues to grow, the library will continue to monitor the usage of Late Night Study and encourages students to contact the library and offer feedback. “The Library is really pleased to be meeting an unmet need for a safe and serious place that UCSB students can rely on to devote to their academic studies,” according to Metzger. More information regarding hours and contact information can be found on the UCSB Library website.